Stansted is one of the international airports in London located in the north east area at approximately 30 miles distance from Central London. This distance is not easily covered especially if your flight lands at night and the public transportation is scarce. 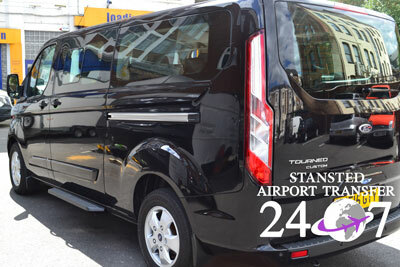 For this reason you can easily book with 247 Stansted Airport Transfer. Our minicabs will transfer you at any given location so that you can arrive safely to your destination. One common service requested by our customers is the Stansted to Stratford station taxi service. Stratford is one of the multilevel railway stations in London and it is based on the east side of the Town. This is the 9th busiest station in the city and handles about 25 million passengers each year for arrivals and departures. Stratford is divided in 2 types of platforms: high-level and low-level. 16 high-level platforms are used by London Overground North London lines, Central lines, DLR, TfL rail or Abellio fast lines. The Low-level platforms are a total of 4 that serve the Jubilee line and the DLR services. As mentioned at the station you will find the national operators: Abellio, TfL, London Underground, c2c, DLR and the tube station with connection with the Jubilee line. As a fun fact in 2012 Summer Olympics the station was the key arrival point. Stratford has two bus stations on the south and on the north side of the station that provide direct connections across London and also to the Olympic Park. The Stratford International Service offers high speed services provided by Southeastern. If you are looking to reach St Pancras Station you can do it via the DLR line that links the stations. For other information or requests regarding the services provided at Stratford station you can call the customer service line at 0345 222 34 56. Other options that we have at the station are free Wi-Fi and also mobility access (for particular inquiries you can contact the help line). Booking a Stansted to Stratford station taxi service is easily done with 247 Stansted Airport Transfer. Our booking system is very easy to use and in a couple of minutes you can secure your private vehicle. The price for the transfer starts at 45GBP for a saloon vehicle that can fit up to four passengers. If you are a group that needs a transfer you can book one of our 8 seater vehicles for a price starting at 75 GBP. The company covers also bookings with wheelchair accessible vehicles. The journey is going to take around 44 minutes and you will cover 34 miles. Another means of transportation that will cover the journey from Stansted to Stratford station is the bus. With the Line A52 the journey will take about 50 minutes the buses having a frequency of departure of 30 minutes. Otherwise you can reach the station via train using the Stansted Express Line to Tottenham Hale and change with the National Express East for Stratford, making a journey of 43 minutes, not including the waiting time between the lines. Our clients recommend the Stansted to Stratford station transfer service for the professionalism of our drivers and staff and also for the services which include: free meet&greet, free Wi-Fi, monitoring the flight, etc. Get a discount today for your journey – contact us!